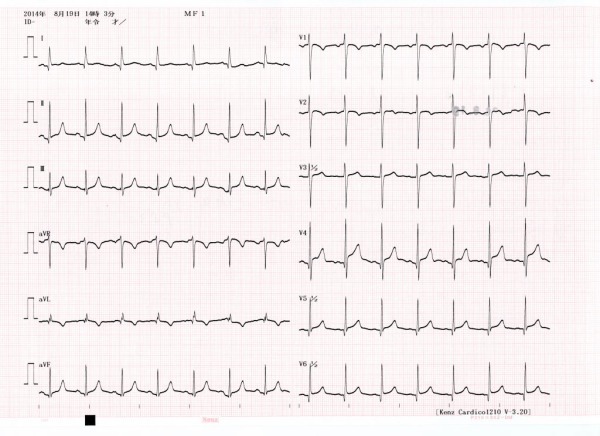 Takotsubo cardiomyopathy (TC) is characterized by transient left ventricular dysfunction. We describe a patient with stroke who presented with TC caused by serotonin syndrome (SS) following the administration of serotonergic and dopaminergic agents. A 55-year-old man with stroke was administered venlafaxine, tianeptine, ropinirole, carbidopa/levodopa, bromocriptine, and methylphenidate during rehabilitation. The patient presented with clinical features of SS (mental confusion, agitation, hyperhidrosis, chills, rigidity, and tachycardia), which persisted over 24 hours. The day after his SS symptoms disappeared, the patient's blood pressure decreased, and he developed tachycardia. He was administered oxygen at 8 to 10 L/minutes via a Venturi mask, and norepinephrine bitartrate was administered intravenously. Hydration was maintained with normal saline infusion.